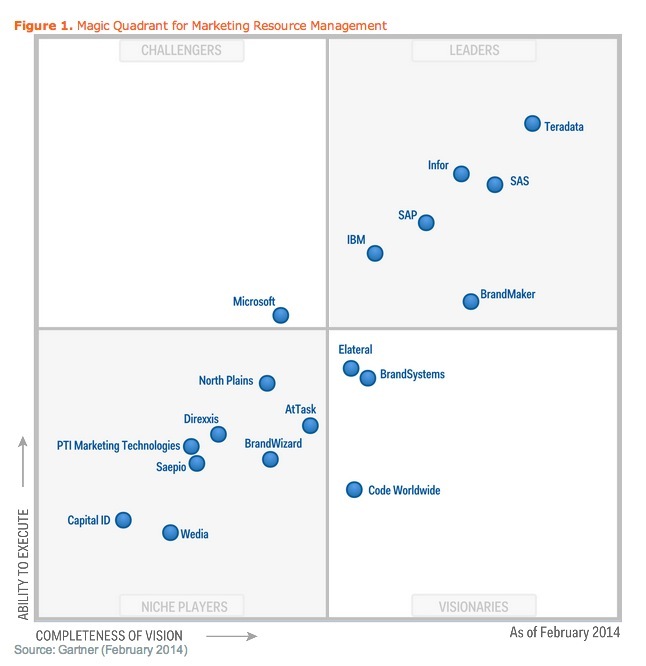 Gartner has just released the 2014 update to its ‘Magic Quadrant’ report for marketing resource management (MRM) vendors. The IT research and advisory firm’s Magic Quadrant reports lay out the vendor landscape and categorises players that meet certain criteria into one of four segments. Leaders: demonstrate exemplary performance, deliver breadth and depth of integrated functionality on large, enterprise-wide and global implementations that extend MRM across the marketing organisation, and successfully articulate business propositions that resonate with buyers. Challengers: have entered the MRM market primarily to provide offerings that complement their established business applications (expecting to leverage their large installed bases), typically offer breadth of functionality, although often at the expense of depth and innovation, provide value in terms of ease of integration with their enterprise applications, but have a limited understanding of market trends and marketing buyers. Challengers are unable to consistently and effectively articulate their visions, or they have not mobilised their resources to excel in the market segment. Visionaries: have a strong vision for applying technology to MRM-related issues, but have not yet mobilised resources or developed a robust business model for global expansion on a large scale. Market thought leaders and innovators across most of the five competency areas of MRM. Will need to grow to achieve sufficient scale in the MRM market and to provide more consistent execution to become leaders. Niche players: perform well in a small segment of the MRM market, have a limited ability to innovate or outperform other vendors. They are focused on a specific geography or industry, or they focus primarily on a portion of the MRM competencies and functionality. Niche players have limited implementations and support services for MRM, and may not have achieved the necessary scale to solidify their market positions. For inclusion in the Quadrant, vendors must demonstrate three things: market traction and momentum, which means minimum requirements for revenues, new and total customers, and geographical spread; certain product capabilities; and, short-term viability. Each vendor meeting those requirements is then ranked according to 15 criteria across two broad areas: ability to execute and completeness of vision. The 2014 update sees the addition of AtTask and Wedia, and the dropping of Adnovate, which did not meet the minimum revenue criteria. 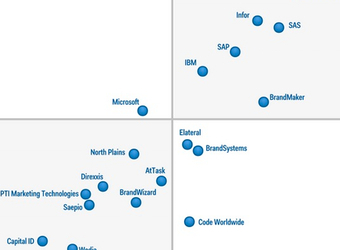 More information about the Magic Quadrant is available on Gartner’s website.